Joe FitzPatrick MSP launched the national strategy for preventing and reducing drug and alcohol-related harm at an event held in Gowrie Care’s Cairn Centre in Dundee today. The Scottish Government’s strategy, “Rights, Respect and Recovery”, says Scotland will take a health approach to substance misuse and focus on people’s needs. This includes supporting the families of those in recovery as well as treating wider issues such as housing, employment and mental health. The strategy also emphasises education and early intervention for young people and those most at risk of becoming addicted to alcohol or drugs. Public health minister Joe FitzPatrick explained: “Improving how we support people harmed by drugs and alcohol is one of the hardest and most complex problems we face, but I am clear that the ill-health and deaths caused by substance misuse are avoidable and we must do everything we can to prevent them. This means treating people and all their complex needs, not just the addiction, tackling the inequalities and traumas behind substance misuse, and intervening early to prevent people at risk. Gowrie Care’s managing director Joy Dunlop commented: “I’m delighted to welcome Joe FitzPatrick MSP to our service to launch such an important strategy. Gowrie’s ethos encourages innovation so that services remain relevant and we continue to deliver meaningful outcomes for the people we support – key to this is ensuring the people we support are at the heart of everything we do. “Gowrie is committed to not only supporting those in recovery, but also offering family members advice and guidance through our SMART Family and Friends service. 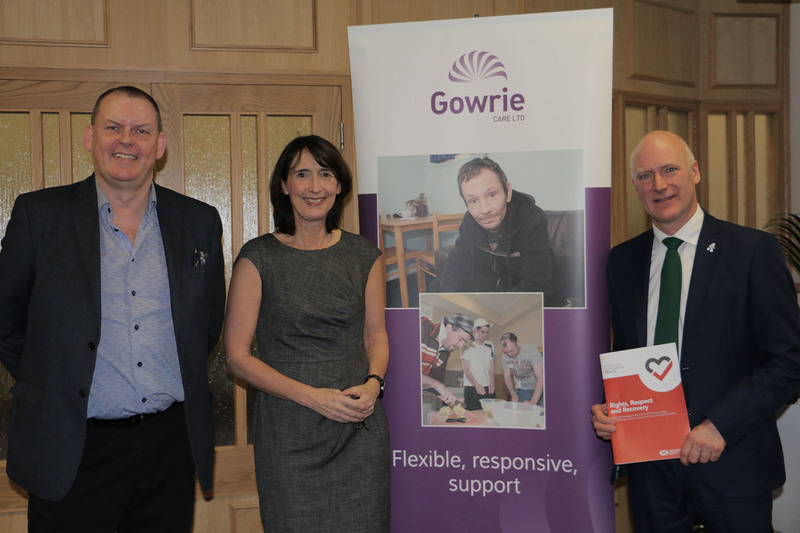 Pictured: Alastair Gardiner, Head of Service, Gowrie Care; Joy Dunlop, Managing Director, Gowrie Care; and Joe FitzPatrick MSP.